The name and dll attributes respectively specify the name and provider DLL of a compression scheme. IIS 7 supports both Gzip and Deflate compression, and both compression schemes are currently implemented in %windir%\system32\inetsrv\gzip.dll. The doStaticCompression attribute specifies whether static compression is enabled for the compression scheme that is specified by the name attribute. 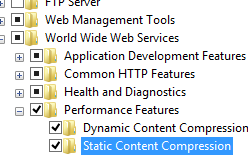 Setting doStaticCompression to true specifies that static content will be compressed when requested by a client. If static compression is enabled, each request for static content that contains the "Accept-Encoding: gzip" or "Accept-Encoding: deflate" header causes the content to be compressed, so long as the compression scheme specified in the header is enabled in IIS. If the request does not contain this header, or the header specifies a compression scheme that is not enabled in IIS, the content is not compressed. 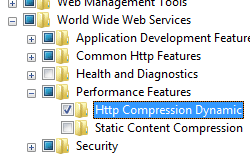 If IIS determines that the response should be compressed, IIS checks the compression directory specified by the directory attribute of the <httpCompression> element. If a fresh, compressed version of the static file is found in the directory, it is sent to the client browser. If a fresh, compressed version of the file is not found, and on-demand compression is enabled with dynamicCompressionBeforeCache attribute of the <urlCompression> element, IIS sends the requested file in uncompressed form, and adds that file to the background compression queue. The doDynamicCompression attribute specifies whether dynamic compression is enabled for the compression scheme that is specified by the name attribute. 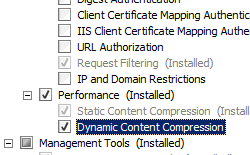 Setting doDynamicCompression to true specifies that dynamic content will be compressed when requested by a client. If dynamic compression is enabled, each request for dynamic content that contains the "Accept-Encoding: gzip" or "Accept-Encoding: deflate" header causes the content to be compressed, so long as the compression scheme specified in the header is enabled in IIS. If the request does not contain this header, or the header specifies a compression scheme that is not enabled in IIS, the content is not compressed. 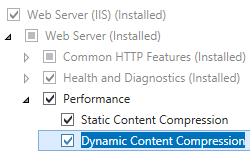 Because dynamic content is by definition always changing, IIS does not cache compressed versions of dynamic content. Dynamic compression consumes considerable CPU time and memory resources, and should only be used on servers that have slow network connections and CPU time to spare. 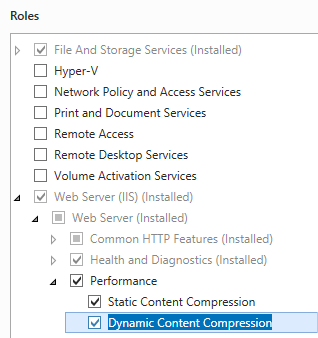 The dynamicCompressionLevel and staticCompressionLevel attributes specify the compression levels for the compression schemes when IIS is respectively compressing dynamic or static content. Lower compression levels produce slightly larger compressed files, but with lower overall impact on CPU and memory resources. Higher compression levels generally result in smaller compressed files, but with higher CPU and memory usage. By default, only the Gzip compression scheme is available in IIS 7. To enable the Deflate compression scheme programmatically, see the Code Samples section of this document. IIS 10.0 The <scheme> element was not modified in IIS 10.0. IIS 8.5 The <scheme> element was not modified in IIS 8.5. IIS 8.0 The <scheme> element was not modified in IIS 8.0. IIS 7.5 The <scheme> element was not modified in IIS 7.5. 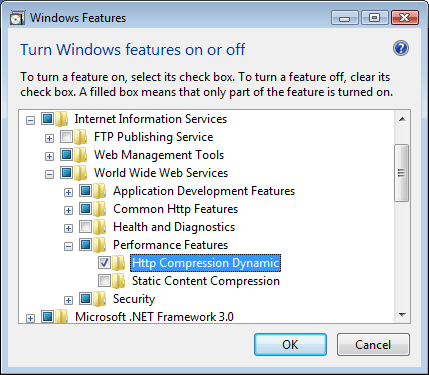 IIS 7.0 The <scheme> element of the <httpCompression> element was introduced in IIS 7.0. 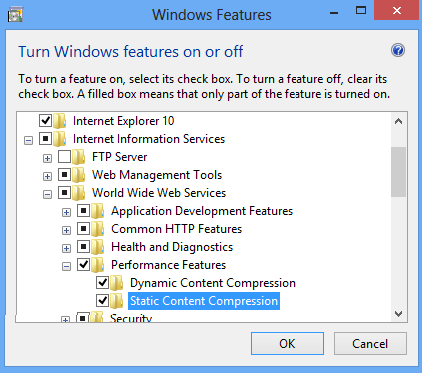 There is no user interface for setting the compression scheme for IIS 7. For examples of how to set the compression scheme programmatically, see the Code Samples section of this document. Specifies the fully qualified file system path and file name of the compression DLL associated with the compression scheme. The World Wide Web Publishing Service (WWW service) must be restarted before any changes to this attribute take effect. Specifies whether responses to requests for dynamic content, such as scripts in Active Server Pages (ASP) and ISAPI extensions, are compressed. If this value is changed at the individual compression scheme level, the WWW service must be restarted before the change takes effect. 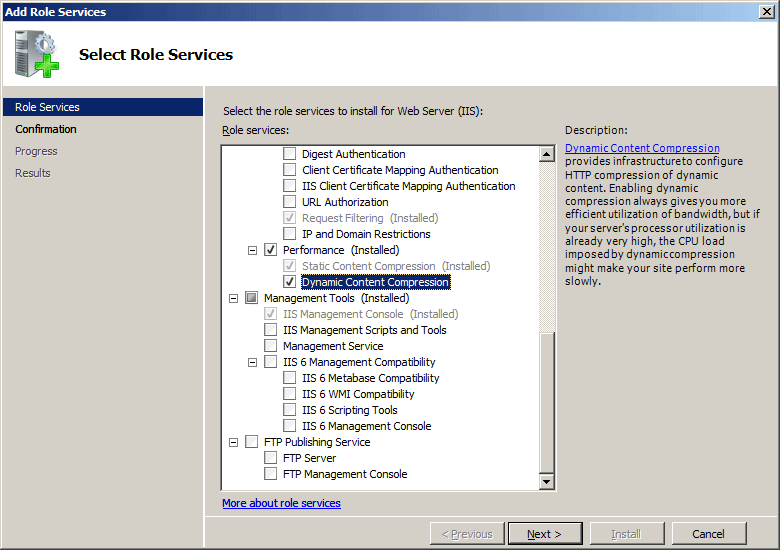 Specifies whether IIS compresses responses to requests for static content. Because this attribute cannot be inherited, it must be set to true at both the global level (<httpCompression>) and the individual scheme level if the name attribute is set to Gzip. If this value is changed at the individual compression scheme level, the WWW service must be restarted before the change takes effect. Note: The static compression store needs to be located in a disk partition or remote share formatted with NTFS. If the file store is not NTFS, static compression is disabled. For security reasons, no compressed responses will be served from a FAT cache store. Specifies the compression level for the compression scheme when dynamic content is being compressed. The levels range from 0 (lowest compression level and lowest CPU usage) to 10 (highest compression level and highest CPU usage). The WWW service must be restarted before any changes to this attribute take effect. Note: Because dynamic compression consumes considerable CPU time and memory resources, use it only on servers that have slow network connections and CPU time to spare. Compressed static responses can be cached and, therefore, do not affect CPU resources as dynamic responses do. Specifies the name of the compression scheme. For example, Gzip or Deflate. Specifies the compression level for the compression scheme when static content is being compressed. The levels range from 0 (lowest compression level and lowest CPU usage) to 10 (highest compression level and highest CPU usage). 0 means that compression is disabled. The WWW service must be restarted before any changes to this attribute take effect. The default value is 7. Removes a reference to an HTTP compression scheme from the HTTP compression scheme collection. Removes all references to HTTP compression schemes from the HTTP compression scheme collection. The following code samples add the deflate compression scheme to IIS 7.